Aluminum electrolytic technology delivers the highest capacitance levels of all capacitor families (up to 2.2 Farad). This is why they are used in filtering functions for inverters and converters, electrical backup systems, power for discharge circuits (e.g. in flash lamps) or for motor supercharging (e.g. in armored vehicle turrets). These products were for long considered as being for industrial applications only, but continuous research at Exxelia Sic Safco has led to the development of ranges ideal for medical, arms and aircraft applications, breaking new ground in the temperature ranges supported by this technology. Exxelia Sic Safco is in fact remarkable in developing its own electrolytes, enabling ideal solutions to be found for each application. Screw terminals are large capacitors supporting high energy loads. 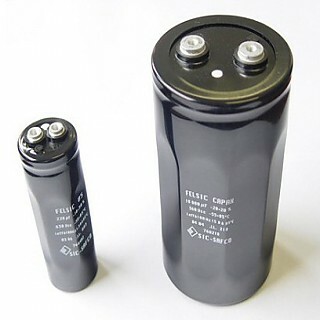 Exxelia Sic-Safco markets these capacitors under the FELSIC brand, with a range of families available to meet different project requirements. For example, the capax family has high energy density while the I-PLUS family withstands very high voltages with no impact on life time.